The wife of former Illinois Gov. 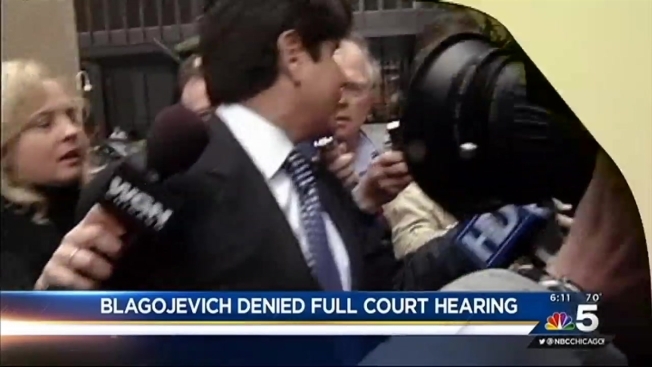 Rod Blagojevich and his lawyer said Wednesday they would appeal to the U.S. Supreme Court after a full appellate court announced it would not rehear the appeal of the former governor's corruption convictions. The 7th U.S. Circuit Court of Appeals posted a notice indicating there would be no rehearing for the imprisoned Blagojevich, who hoped the full court might overturn more of his 18 convictions than the five counts a three-judge panel tossed in July. The only remaining option for more counts to be overturned is an appeal to the U.S. Supreme Court. "While I am disappointed that the petition for rehearing was denied, I am thankful that the decision came quickly because the waiting is awful," Patti Blagojevich said. "What's clear is that in order for us to see justice, the appeal needs to be taken out of Illinois and be in the hands of the U.S. Supreme Court where we can find fairness and impartial justice." Leonard Goodman, Blagojevich's appellate attorney, echoed Patti Blagojevich's hope for justice in the Supreme Court, adding that the decision in Illinois was "flawed." "We believe the decision is flawed and puts every public official, who must raise campaign funds to stay in office and to be effective, at the mercy of an ambitious or politically-motivated federal prosecutor," Goodman said. "But we remain hopeful that we will prevail in the end because the decision is in conflict with established legal precedent which has existed for more than 20 years. Now we will appeal to the U.S. Supreme Court."